Details at the end of this review on how to enter to win a copy of If You’ve Got It, Haunt It, along with a link to purchase the book where a portion goes to help support KRL & an indie bookstore. More than willing to allow the Sugar Creek Georgia police department to lead the investigation, Cookie goes to her best friend, Heather, for help exorcising the ghost. Unfortunately, it turns out that Heather, who owns an occult store, is something of a psychic fraud, if a well-meaning one. Just as disturbing is that the adorable stray white kitten Wind Song seems to have far more prescient powers. Her talents with tarot cards and a Ouija Board prove dire, but contain astoundingly good grammar. The ladies soon learn that a private investigator is similarly interested in Charlotte’s murder, but his own death indicates that danger still lingers, despite Charlotte’s adamant claims that she was universally loved. Unnerving Cookie even more is the handsome presence of Detective Dylan Valentine, who is suspicious about her continual involvement in his case, as well as certain that she is hiding a secret. Whatever his interest in Cookie though, dating is pretty much off the table unless she can encourage Charlotte to move on, giving Cookie peace of mind and a little privacy. The author of numerous paranormal and mystery series, Rose Pressey nicely walks the line between Charlotte’s feeling understandably unavenged and being an annoying nag. Cookie and Charlotte are a very entertaining team, with Charlotte providing unsolicited diet and fashion critiques that Cookie unapologetically ignores. Chapters alternate between headings of the blog Cookie’s Savvy Vintage Fashion Shopping Tips and Heather’s Heartfelt Tip for Getting Rid of an Unwanted Ghost, the former being far more knowledgeable, but the latter more entertaining. The tone is always fun and humorous without becoming absurd, and the information about vintage couture, and the beautiful descriptions will have readers yearning for accompanying illustrations. The mystery plot moves along swiftly and the clothing never distracts from Charlotte’s compelling reason for haunting Cookie. This is a charming new series that blends the paranormal and vintage fashion with a lead character who copes admirably with a relentless, if well-dressed, incorporeal client. To enter to win a copy of If You’ve Got It, Haunt It, simply email KRL at krlcontests@gmail[dot]com by replacing the [dot] with a period, and with the subject line “Haunt,” or comment on this article. A winner will be chosen January 3, 2015. U.S. residents only. If entering via email please include your mailing address, and if via comment please include your email address. 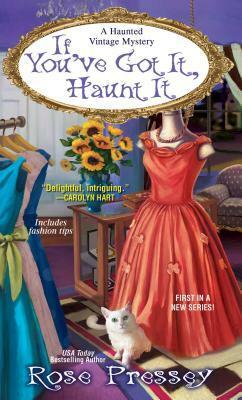 If You Got It, Haunt It sounds like an awesome book mixing supernatural and a good cozy mystery. I am looking forward to reading it. Please enter me in the contest. Adore all these bright book covers! Book sounds good too! Sounds like a great story. Please enter me in the contest. I can’t wait to read this one! I love Rose Pressey ‘s books. I hope to win but ifI don’t I hope to be able to buy it sometime after the new year! This time of year just can’t afford it. A recent post from toni lotempio: And to all a HAPPY HOLIDAY! Always up for something ghostly. I can’t wait to read this, I’ve seen a lot of good reviews on it. Thanks for the chance to win. Sounds like a fun read. I would like to get to know Charlotte – after all, everybody likes her! Thanks for the giveaway. I have this on my list to read, but haven’t gotten to it yet! Like the cover – that’s what usually catches my eye to even pick it up to read a summary. Thank you for the opportunity to win a copy!